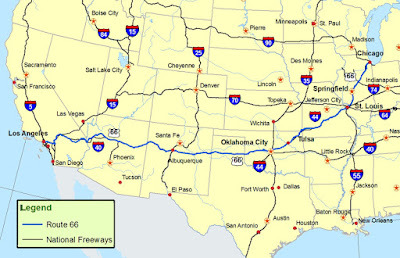 Route 66 is the Automobile Age's Oregon Trail and Transcontinental Railroad, combined into one. It has been the symbolic and frequently the actual route for Americans to migrate westward. It is a holiday route for Europeans who want to experience main street America - but who do not want to experience the America of interstates or airports. A more recent movie (Cars by Disney, 2006) has also highlighted how Route 66 helped small towns along the route of the highway thrive. 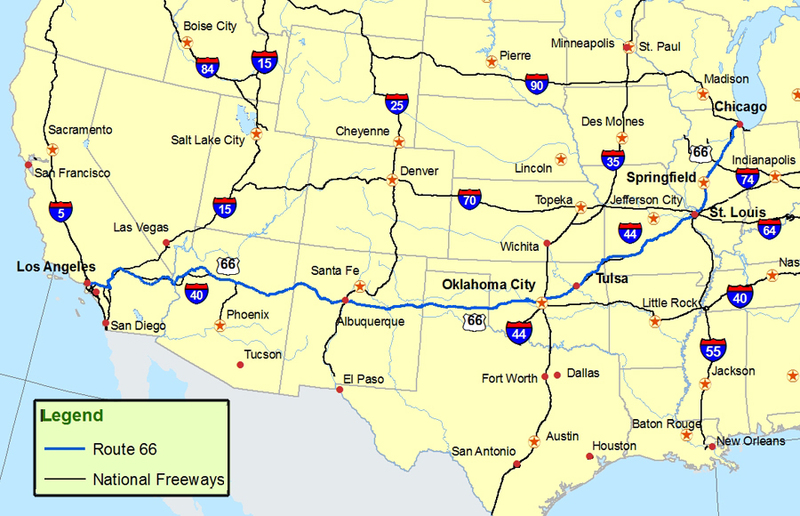 Today, as most Americans fly cross country, much has been lost along this highway which once connected the eastern and western halves of our country. We would venture to guess that most Americans have never driven even a small part of this famous road. Today, America faces many challenges. Much of our history is being forgotten. The automobile and by extension this famous highway are becoming viewed more as the causes of problems (traffic, carbon dioxide emissions) rather than solutions to problems. That is why an effort is being led by retired General Frank Schober of New Mexico and Pieter Hoff, inventor of the Groasis Waterboxx PlantCocoon®, of the Netherlands, to plant trees along the famous old Route 66. The first leg of this effort has been already been completed, with Waterboxxes being purchased for use in Galena, Kansas. You can see a video about that planting here. This tree planting effort shows how a brilliant new technology, the Groasis Waterboxx PlantCocoon®, can allow trees and motorists to develop a symbiotic relationship. The trees rely on the carbon dioxide emitted by the cars to grow, and the motorists get the fresher air and better scenery provided by the trees. The Waterboxx PlantCocoon® allows this relationship to come about because it fundamentally changes how trees get water. The Groasis Waterboxx PlantCocoon® is the ideal technology for planting trees along Route 66. It collects and stores dew and rain water, and slowly funnels it to the roots of the growing tree sapling. This forces the tree to grow deep tap roots which allow it to survive droughts, even after the Waterboxx PlantCocoon® is removed. The Waterboxx PlantCocoon® can be removed and reused to plant other trees for up to ten years. We hope to plant many long lived trees with this device along Route 66 and in other deforested places. If you own or care for land along Route 66 and would like to plant trees with the Waterboxx PlantCocoon®, it is available in business order sizes here or consumer order sizes here.